Utilizing “Blur Screens” can be a unique and effective way to create an advantage for your offense. Defenses invest hours of practice time learning how to defend common offensive actions such as ball screens, off-ball screens and dribble handoffs. The typical practice plan features a block of time devoted to the techniques and communication required to defend these elements. Rightfully so, they make up the vast majority of offensive actions contain in most offenses. Blur Screens seek to achieve the same goals – create an advantage and disorganize the defense – as the screens mentioned above, but do so in a not-so-obvious manner. Screening without screening is something your opponents may not have a plan for. 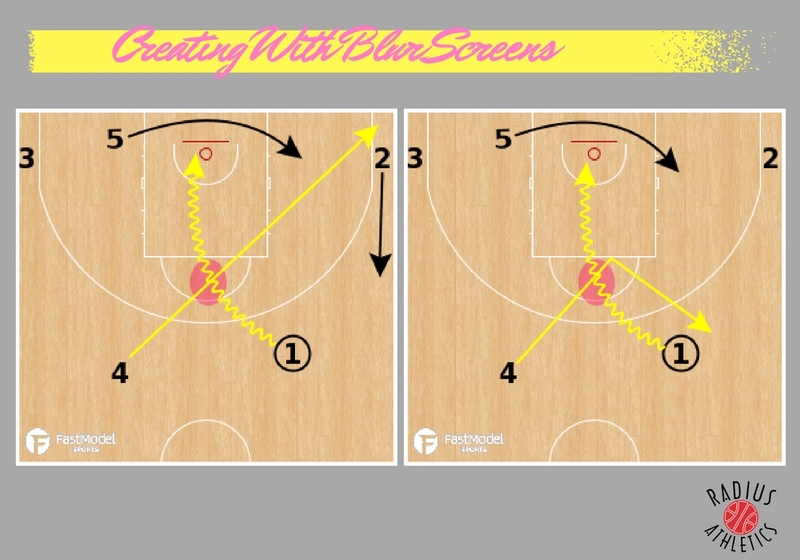 Let’s take a look at some Blur Screen concepts that may be valuable towards creating an advantage in your offense. You may hear coaches refer to Blur Screens as rub cuts or brush cuts. You may also hear opposing coaches call them illegal screens! But a Blur Screen seeks to utilize the intersection of the paths of two players to rub off a defender thus providing an advantage. Below are four common Blur Screens for the ball handler. Long-time Davidson coach Bob McKillop says players should “have an act” and having an act along with good timing are keys to Blur Screens. For example, in Frame 1 above, Player 4 must sell that he/she is innocently cutting to the far corner. Cut hard to the corner as is normal in many offenses. The ball handler (Player 1) times his/her drive to intersect so that his/her defender gets caught in the traffic. The Bump Out in Frame 2 is similar except that Player 4 jumpstops and reverse pivots somewhere around or just below the free throw line then cuts back out beyond the arc essentially replacing Player 1. 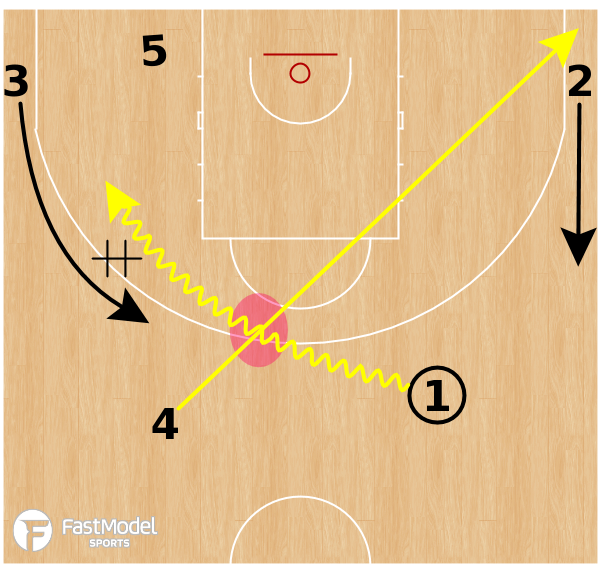 Many offenses such as the Triangle Offense or High-Low Offense feature the pass to the wing then make an inside cut to the corner. This presents the Blur Screen opportunity you see in Frame 3 above. Again, Player 1 innocently cuts to the corner; it is the responsibility of the driver to create the rub. In Frame 4 above we see what appears to be a run out ball screen with a roll or pop. But in lieu of the traditional ball screen where the screener jumpstops into the screen, gets set and sets an angle, the screener merely blurs near the on-ball defender to cause him/her to hesitate a bit. 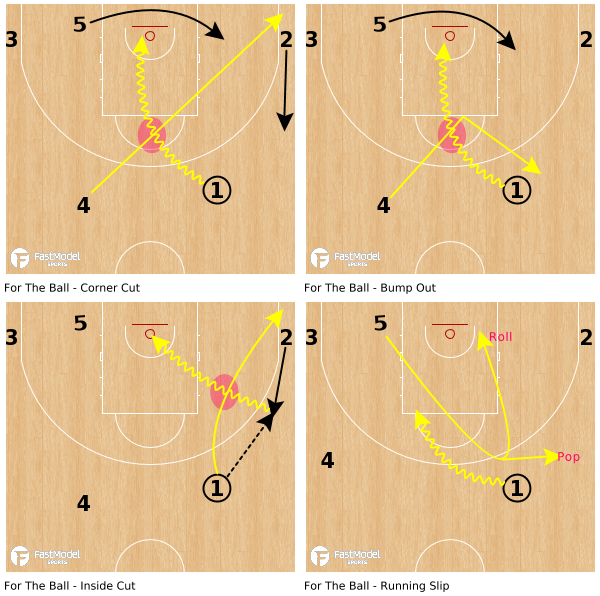 The Houston Rockets often use what amounts to a running slip rather than the traditional ball screen. Slice action uses a Blur Screen to rub a cutter free. Again, the intersection of two paths is the mechanism for the advantage, this time for an off-ball cutter. In the first frame above, Player 2 blast cuts to the single gap to receive a wing entry. The first cutter, Player 1, innocently cuts to the far corner. The second cutter, Player 4, slices off Player 1’s cut. Ideally, the timing of the intersection rubs off Player 4’s defender and Player 2 is able to enter to the second cutter. In the second frame we see Slice action with a bump out. Slice action can be used to get a post touch as well. In the frames above, Player 1 hits Player 2 at the wing off a blast cut to the single gap. On airtime of the wing entry Player 5 lift to the elbow. As is common in many offenses, the passer – Player 1 – basket cuts after the pass. Player 5 times his/her cut to intersect with Player 1’s basket cut. Blur Screens can serve as down screens as well. The “screener” cuts to the corner seeking to catch the cutter’s defender in the traffic. The cutter may curl around the corner cut to create the blur or exchange with an advantage if X2 gets caught in the traffic. The defender hesitating to dodge the “screener” creates the desired advantage. Having an act is once again important. Any collision must appear inadvertent. The handoff has two components, the recipient and the deliverer. Blur Screens can be used to enhance handoff concepts by rubbing either the recipient’s or the deliverer’s defender. Above, the deliverer is Player 5 and the desired recipient is Player 3. Player 4 is in the single gap between the two players. He/she cuts through and Player 3 times their rise out of the corner to catch X3 in the traffic. Even the slightest hesitation or alteration of path by the recipient’s defender can create a usable advantage. The methods already mentioned for using a Blur Screen to aid the ball handler can apply to the deliverer of the handoff. Clipping their defender provides a clean corner for the recipient of the handoff to turn. Player 4 cuts innocently to the far corner and Player 1 dribbles off this cut hoping to clip his defender in the traffic. This helps to disrupt the communication and positioning of the deliverer’s and recipient’s defenders. 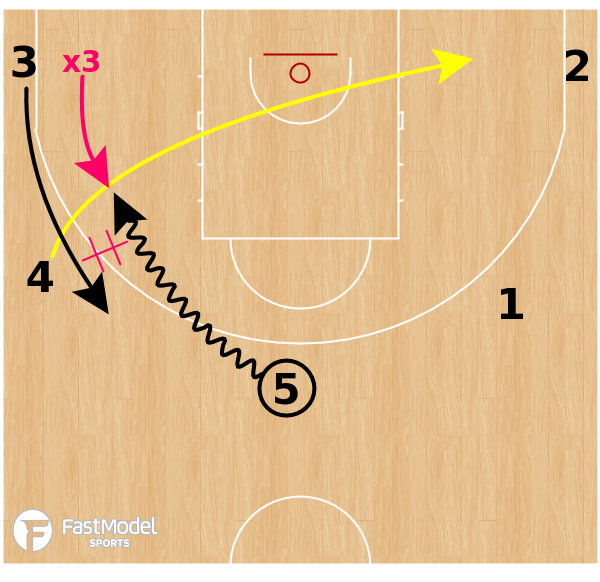 Creating an offense heavy on Blur Screens can open gap space and present unique ways to create advantages for ball handlers and cutters. The action can also enhance dribble handoffs. The Blur Screen is designed to force a reaction from the defense that they have perhaps not rehearsed. The goal of all of these Blur Screen concepts is to create an advantage that will force the defense to collapse and protect the rim. If they do, this opens up inside-out opportunities as a result.